Ukraine’s attempts to cut off water supplies to Crimea caused significant droughts last summer, but now Russia is rushing to compensate for the deficit. The first lines of newly installed water pipes are already feeding the peninsula from artesian wells. 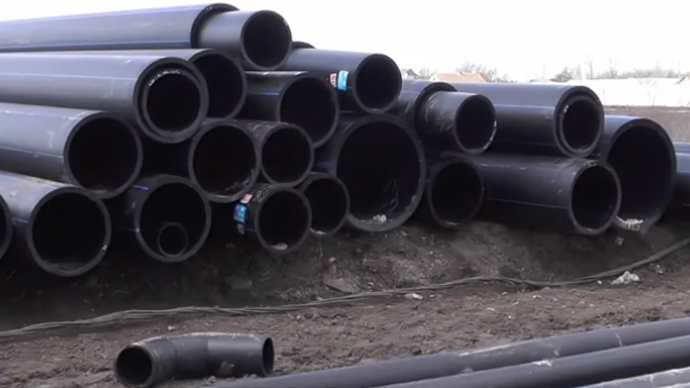 Over the past week, despite rough spring conditions and muddy turf, engineering battalions from Russia’s Eastern and Western military districts have laid some 7,000 pipes in 8 pipelines connecting artesian wells in the western part of peninsula with the Crimean canal. Aleksandr Sinyov, the pipeline’s battalion commander, stated that “eight lines of pipes have been mounted and are already connected to a deep well pump.” Crimea’s water supply is a “very important objective” he said, and this is why servicemen are taking their work “extremely seriously” to assemble the network as soon as possible. Over 41 km of pipes have been laid so far, and upon full completion, the network will consist of some 48 pipelines stretching for 372 km (231 miles). The aim is to connect the North Crimean Canal used for irrigation and watering to the well fields located in the northeast of the peninsula. The wells are some 200 meters deep and draw water from three underground lakes. “The capacity of the three intakes, which will be put into operation, will be equal to 175 thousand cubic meters per day. This is enough for two cities,” said the head of the construction of water intakes, Vassili Zaitsev. The Russian military has deployed over 500 servicemen and over 200 pieces of machinery to complete the construction. Connecting artesian wells is the first phase of the project. After work on the wells is completed, construction of a large-diameter pipeline stretching about 1,000 to Kerch. Before joining Russia in March, Crimea was getting up to 85 percent of its water needs through a canal stretching from the Dnepr River. Kiev closed the floodgates of on April 26 last year and built a dam that blocked freshwater supplies. The Crimean authorities have repeatedly asked Kiev to negotiate water supply contracts. But Kiev is keeping up the pressure on Crimea whose agriculture sector is fully dependent on the irrigation supply.